HomeCompound NewsSave Not Shame! It’s what Lonnie Would Do. During these tumultuous times, vicious rumors, and terrible evil seem to have befallen us all, which, is no doubt, the fault of masturbators ruining the Earth as the make themselves pawns to the sick, evil, plans of Satan. But recently, we have all had to make sacrifices, and changes within our lives. Be it being beaten severely for destroying priceless religious artifacts, a diesel power station, befouling the well, burning Lonnie’s guest house, award-winning, mint-condition 1987 Buick Grand Sport and prize-winning milking cat Bessy to the ground with the use of forbidden necromantic fire, or being arrested a second time for public masturbation, this time at Sea-World, while crying out to the sea urchin tank, and getting a very painful sea-otter induced injury that required 144 stitches and the wearing of a truss, we must find it within ourselves to be as Jesus, and forgive. My greatest friend and most hated enemy, the foul, abnormal, penisless, freak, and terrible avenger of the Word of Lonnie Childs, Roddy Black, badgered me relentlessly to change. I being a powerful wizard of the 23rd Level, who is self-chaste, and an overall beautiful and famous person of immense talent, did not see the purpose. I was powerful beyond my wildest dreams, and had used my scooter to become over confident and arrogant! Though I do not wish to delve into the specifics my transgressions, know that even though many, many people died horribly, no masturbation was involved. My failings brought about the pain of the wrath of Lonald himself, and my staff was taken in his mighty hands and broken en twain, sundering my connection to the Astral Plane and Lord Ooort’hekgog, making me as non-magical as a pretty magical being, but not nearly magical enough to be a wizard. My scooter, which laughed at me throughout this ordeal had been winterized and put in storage! No more shall I ride such an insipid traitor! Yes I have changed my ways and embraced the Light of Rodomoy. Now, after begging forgiveness, Father Lonnie Childs Mighty And Righteous Lord of Earth as Jesus has considering forgiving me! Soon, I am certain I shall be allowed to sleep indoors once more. Brother Paul Horner, my close personal friend and accomplice, has also fallen upon bad times as he fell off the wagon, again. 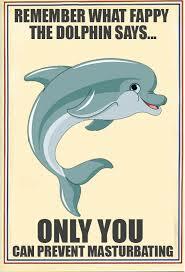 Many of the more disgusting members of the Flock have called for Paul to resign from his role as my beloved Fappy The Anti-Masturbation Dolphin, but I say let him remain! Fappy, though now a real being, who maybe someday, I could hang out with, is usually a man in a fur dolphin suit. What the man does in his furry mascot suit in his off time does not represent what he does in the furry suit while at work. And though his masturbations and sea-otter injuries are reprehensible, it is my personal belief that Paul was not of his right mind. Paul has been being brain-washed by his cat for some time now, he is but a shell of the man that was once Banksy, a mere mindless drone-puppet, made to dance like a monkey to the organ-grinder. This vile feline has been playing Paul Horner like a game of SMN Non-Masturbatory Faithgame of the Year: Fallout 4. It’s sick really, but must mostly it’s just sad. Paul is a sad and mentally diseased man. We must forgive him too. Hopefully, Paul will see the his cat’s evil, and regain his mind and become a human being again, but only if we support him in his dark, dark times. Only through forgiveness can we truly begin to heal from the terrible tragedies, that are in no way our own fault whatsoever, as we are all unfortunate victims of circumstance, for we have devoted ourselves to Faith, and thus can absolve from consequences, if we pray and believe really, really hard. We really must forgive everyone who has ever taken the SMN Pledge, because at least they took the pledge. We must remember that we are all here to fight for Lonnie’s Mission, and not for personal gains and shames. We are Christians United in Lonnie’s Teachings! If anyone in the Campound has a spare room to rent, or perhaps a shed, please IM me! 1 Comment on Save Not Shame! It’s what Lonnie Would Do. How many lines of coke did you snort off Paul Horner’s asscheek before writing this?